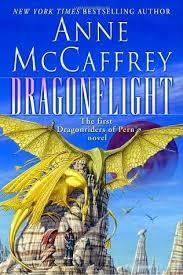 In Dragonflight, disaster is looming in the intriguing world of Pern. The dragons that protected it from Threads and the space parasites that burrow and multiply are much fewer in number. The Red Star, planet of the Threads, is approaching, and the atmosphere gets extremely tense almost too quickly. All the Holders have grown lax in their prevention methods, letting plants grow in their Holds, attracting unwanted Threads. However, completely ignorant of the peril, Lessa of Ruatha Hold plans to stop hiding and proclaim she is one of the Ruathan Blood, fit to be a Weyrwoman and lead Benden Weyr. She is chosen by F’lar, a bronze rider, to have a chance at Impressing the queen dragon, and succeeds. When the Threads start falling again, Lessa must use a skill neither she nor the dragonriders knew existed to rally people who disappeared many years ago to save Pern! This very eye-catching world has plenty of details, entertaining characters, and most importantly, a remarkable atmosphere. The world of Pern is beautifully described without having too much detail, and the backstory is impressive. The characters are all different, such as Lessa being cunning and bold while F’lar is subtle and has a habit of keeping his own counsel. The atmosphere is excellent, being stressful, exciting, and sad all at different times. This adds a great feel to the book and makes the story more impressive. Overall, this book is a spectacular pick if you are a reader who enjoys science fiction or fantasy.